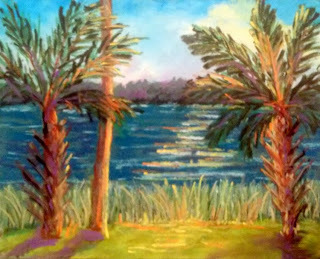 Tomorrow I'll be going to St. Augustine to take a 3-day workshop with Michael Chesley Johnson. I'm really excited about it, and I spent this afternoon going through my stuff to get ready with the things I need to take. When I cleaned out my plein air cart I found this painting inside a glassine bag. Well I found several paintings actually. But I knew what they all were except this one! This one is a mystery. I have no idea when or where I did it, although it's obviously here in Florida. And I know I did it plein air because it's on an 8x10 Ampersand board, and I only ever use them when I do plein air. So I figured I'd post it anyway. Maybe if I stare at it long enough I'll remember something about it. Update Update! I've figured out what this is. It was done at our First Coast Pastel Society plein air get-together at Princess Place. And I actually see this painting sitting on my easel in one of the photos I posted there. So it's no longer a mystery. And Princess Place is one of my favorite places!